The Office of Sustainability is proud to recognize the diverse efforts that take place at McGill to grow toward campus sustainability. 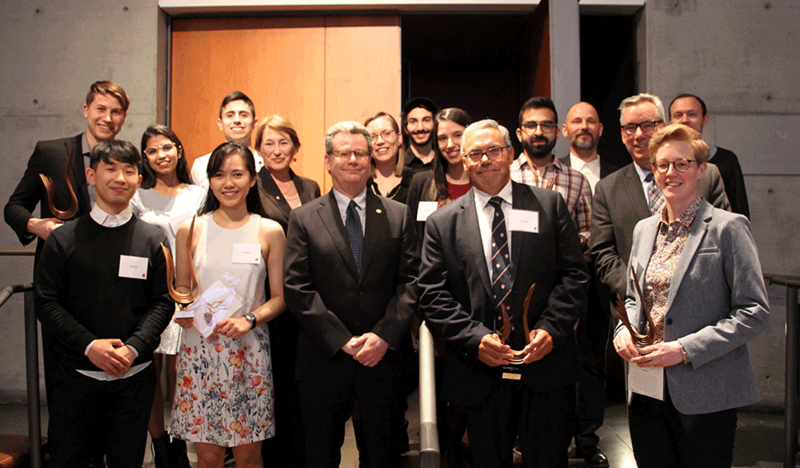 In 2018, our annual Catalyst Awards Gala was redesigned to recognize the achievements of three groups which have excelled in: Operations; Connectivity and Governance & Administration; and the Research and Education Categories of the McGill Vision 2020 Sustainability Strategy. We continue to recognize one outstanding student with the Emerald Key award. The Emerald Key is given out to a student who has made an outstanding and enduring contribution to the sustainability movement at McGill University. The Distinguished Contribution Award recognizes an administrative and support and/or academic staff member who has made a profound, sustained, and cumulative contribution to advancing sustainability in the larger McGill community. McGill Staff members may also win Catalyst Awards for their contributions to the university. These awards recognize staff members who have inspired real change on McGill's campuses, increasing the sustainability of the University. Amir is a PhD student at the Faculty of Management researching the impact of climate risks on business practices and their ability to access finance. During his time at McGill, Amir has served as the Environment Commissioner for the Post-Graduate Students Society in 2015 and 2016. As part of his mandate, Amir represented graduate students at the Sustainability Projects Funds and supported various initiatives to promote environmental sustainability on campus. Notably, Amir facilitated conversations between different stakeholders on campus for McGill to hire a climate officer and to commit to carbon neutrality. Amir has also supported the creation of innovative educational workshops surrounding climate change, gardening, and ecologically friendly lifestyles. For 44 years, Chuck Adler dedicated his career to making McGill University a better place to study, live, and work. As Director of Campus and Space Planning for 20 years, his legacy at McGill is not only reflected in the many projects and plans that transformed McGill’s campuses into more sustainable and human-centred spaces, he also modelled how we ought to work together to create lasting and positive change, that is, with patience, care, collaboration, and inquiry. Chuck was integral in leading the decision to pedestrianize the downtown campus, which resulted in a significant reduction in surface parking spaces on and around the campus and played a major role in the campus' ongoing shift towards active transporation methods. Furthermore, Chuck's leadership resulted in redesigning key areas on campus, like James Square, to create more functional green spaces that better encourage social interaction and exchange—an idea which continues to be realized across McGill’s exterior spaces. Chuck also led the development of McGill's Physical Master Plan in 2008, which defined a number of sustainable practices to guide all future development on campus, from increasing cyclist connectivity to improving campus accessibility. Furthermore, Chuck mentored the Office of Sustainability throughout its establishment and development, and can proudly share in many of its achievements over the years. TeamMTL is a collaboration of students and faculty members from McGill and Concordia universities participating in the international Solar Decathlon China 2018 competition. The competition challenges each team to design and build a net-zero energy, single-family home designed to the highest standards of sustainability. TeamMTL’s proposal, the Deep-Performance Dwelling (DPD), is a high-performance Montreal row house designed to Passive House standards, that holistically addresses both quantitative and qualitative notions of sustainability. This research project has brought together over a hundred students from more than 10 departments working in an integrative and dynamic collaboration to design, prototype, and build the next generation of urban housing. One of the team’s key priorities is to raise awareness of climate change, renewable energy, and sustainable building innovation. 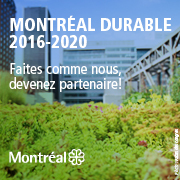 Over the past two years, TeamMTL has continuously promoted its research efforts in achieving a more sustainable world through a series of presentations, conferences, events and guided tours of the DPD prototype to sensitize and educate both the university’s student body and the general public. Sustainable Orientation Project aimed to improve the sustainability of the 2017-2018 student orientation in order to normalize such practices for first-year students as they enter the university. The project managed to include sustainability in training, logistics, and marketing materials to promote sustainable habits and programs at McGill. The project coordinator trained all orientation leaders, using a sustainable event checklist, researched sustainable alternatives (bags, t-shirts, paper, inks, swag, dishes, etc.) and compiled this information for future frosh organizers to increase institutionalization. By working with Faculty Frosh organizers, each faculty frosh create a sustainability coordinator position, some faculty orientation events followed the Sustainable Event Guide, and all frosh bags were of jute, a renewable and low-impact material. In addition, the project worked with SSMU to create a sustainability-themed student handbook with recycled paper and vegetable-based inks that integrated information on living sustainably and getting involved in sustainability initiatives at McGill. Julia Freeman is a Faculty Lecturer at the McGill School of Environment and holds a PhD in Resource Management and Environmental Studies from the University of British Columbia. She is the coordinator of, and an instructor for, the undergraduate field study “Montreal’s Urban Sustainability Experience” (MUSE) where students get their hands dirty learning about the city’s natural history and sustainability challenges. She is an advocate for applied student research at McGill, supervising honours and independent study projects investigating various dimensions of sustainability, from environmental racism to municipal composting. Beyond her roles in teaching and mentoring, Julia has served the McGill community as a Vision 2020 Connectivity Action Team Member, and a former member of the ECOLE Project’s Board of Directors. Julia is currently Chair of the Undergraduate Academic Committee for the School of Environment where she is responsible for overseeing the MSE undergraduate program, with more than 325 Environment Major students, on both campuses. And when spring arrives she looks forward to growing as many pollinator friendly plants as will fit on her deck. As a full-time nurse with McGill Health Services, Louise has gone above and beyond her role in the clinic to promote healthier habits and lifestyles to students and staff throughout McGill University. Understanding that lack of knowledge and other social factors impede one's ability to take control of one's health, Louise has worked tirelessly to bridge this gap in innovative and accessible ways. Notably, Louise spearheaded the Spin Bike Garden Project, a program that promotes mental health and wellness through through physical exercise. Campus users can use spin bikes in four underutilized spaces around the downtown campus surrounded by plants and meditative art, which can help reduce stress and boost energy in the spaces they are learning and working. She also co-created Exercise for Mood with Counselling services, a 9-week program, designed especially for individuals who have struggled to embed regular exercise into their routines. Louise sees student patients full time in clinic appointments where, along with the other nurses, she is very intentional about educating each patient so that they are best equipped to manage their health, reduce suffering, and increase autonomy.